Haunted by Algorithms (1) is a collective work, encompassing a wide variety of exploratory writing styles, from robot journalism to speculative theory. It attempts to imagine the perspectives, sensoriums, and decision-making processes of a multitude of non-human entities whether they be animals, machines, objects, systems, etc. In this flat ontology (2), we hold out the possibility of glimpsing the contours of the human from time to time, just one entity among so many others, all jostling about in networks thoroughly saturated by algorithms. Last year, Média Médiums was in part focussed on the relationship between early technologies for communication at a distance and different forms of spectrality (3). We asked the group of artists, historians and theoreticians working with us to research, analyse and make connections between technical dispositifs produced by well-known inventors and scientists (4) and the various psychical phenomena that accompanied or were engendered by the development of each new medium. Whether the communication was with the dead, the telepathically distant, or humanoid aliens, it was clear that these “irrational” phenomena all pointed towards a desire for an extended anthropocentric conversation in both time and space. This belief in spirit phenomena has faded or rather transmuted over time, in what would seem a trajectory isomorphically opposite to the rise of intelligent machines (5). In the current context of the general algorithmisation of everything, we are more and more intertwined with intelligent and distributed agents which capture and serve as proxies for our emotions, perceptions, feelings, moods and most intimate desires. Essential acts such as eating, caring, sheltering, loving, and reproducing have been optimized, instrumentalized, financialized and fluidified within a vast informational ocean (6). It is as if another type of phantom ecology has descended to Earth, entangling itself into our very existence. We are haunted by algorithms. A premonition of this situation is already present in the short text, Behavior, purpose and teleology (1942) (7), by Norbert Wiener, Julian Bigelow and Arturo Rosenblueth, which anticipates and theorizes the human-machine-animal fusion of the future Cybernetics (8). The authors lay the foundations for a radical equivalency between organic and inorganic systems, an instrumental analogy between substrates that are indifferently biological, chemical, metallic, gaseous, etc. Contours blur, envelopes become porous, forms fluidify and metamorphose, and our ways of thinking reorganise themselves around new values - systems, relationships, connections, networks, etc. They squarely placed emphasis on the interstitial space between things, in communication flows, information exchanges and the interfaces that make them possible, deployment being at all scales, from the molecular to interplanetary governmentality (9). The increasing acceleration of this Copernican decentering of Man in the universe stems in part from this hyper-rationalised engineering perspective. The unknowable black boxes exchanging messages without content of Information Theory has more recently transmogrified into a vast horizon of non-anthropocentric entities which “embody” intelligence, sensations, affects, action and other qualities once attributed strictly to humans, and which are now considered part and parcel of both machines and a whole host of other non-human actors (10). The human becomes marginalised within a new bestiary, surrounded by other forms of sentience and subjectivity : animals, insects, artificial intelligences, viruses, smart objects, surveillance systems, swarms, conversational bots, etc. Our project asks the question of what types of writing or systems for producing text would be appropriate to account for this multi-scalar plethora of non-human behaviors and actions, the majority of which aren’t even addressed to humans. The question takes on particular significance if we consider that writing produced by humans is nothing compared to the massive quantity of that generated every day by algorithms. Automatic writing has morphed into tens of millions of Twitterbots. What would the language of microbes, smartmobs, and swarms be? (11) What is to be like a tic (12) or a bat (13)? How do we appear to machinic subjects? (14) How does one dialogue with plants (15). Speak with God? (16) Talk to kittens? (17) Listen to rocks? (18) Strike up a conversation with the deceased (19). Even the voice of the dead (20) is potentially transferable into alphanumeric language (21). Haunted by Algorithms is a collection of texts wherein the participants take on different roles - curators, researchers, artists, writers, collectors of algorithms or other forms of non-human writings, hunters of absurdities, bugs, logs, and blind spots in the ever-expanding algorithmisation of everything. (1). The book will be published by Les Presses du réel, in two volumes, English and French. The events will take place in Cerisy, France in 2016. (3). One of the starting points being Jeffrey Sconce, Haunted Media: Electronic Presence from Telegraphy to Television, Duke University Press Books, 2000. (9). Antoinette Rouvroy, Le corps statistique, 2009. The research project Media Mediums, has support from the Labex Arts-H2H and is a partnership between the École Nationale Supérieure d’Arts Paris-Cergy and its exhibition space Ygrec, the Université de Paris 8, the Archives Nationales and the EnsadLAB at the École Nationale Supérieure des Arts Décoratifs de Paris. A seminar brings together students from the classes “Communication Protocols : Technology and the Spirit World” (Jeff Guess, Ecole Nationale Supérieure Paris-Cergy) and "Histoires de Fantômes et de Machines” (Gwenola Wagon, Université de Paris VIII) and is open to the public. In 2014 we organised an exhibition exhibition at the Ygrec gallery (4 April-31 may 2014). It was accompanied by four events consisting of lectures, performances, discussions, concerts and demonstrations. We also edited 20 books for the occasion. A book, Haunted Algorithms will be published by Les Presses du réel, in two volumes, English and French in 2015-16. Events are planned in Cerisy, France and maybe elsewhere for 2016. 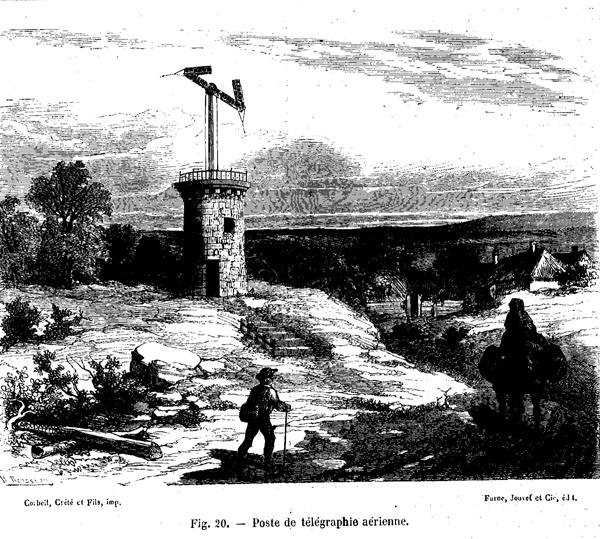 The Chappe telegraph. Illustration in “Les merveilles de la science”, Louis Figuier, 1868. The research project Media Mediums (1) is focused on the history of transmission at a distance and includes two objects of study : Firstly, a long series of technical objects, machines and devices, both implemented and speculative, which have as a foundational principle the transportation of information, and secondly, much more mysterious and less well-known phenomena such as telepathy, telekinesis or teleportation. On first glance, these two objects might seem to be in total opposition with one another. One situated within the extreme rationalism of technical or industrial contexts, anchored within the rigor of scientific method and its theoretical and applied fields : physics, chemistry, electro-magnetics, etc. The other gravitates towards the inexplicable, “aberrant phenomena that when held up to our cultural background of accepted truths... go against common sense and institutionalized (scientific or religious) knowledge” (2), lining up on the side of the occult, spiritualism, and the paranormal. The prefix “tele-”, or “at a distance”, paradoxically tends to link these two fields, to create lines of communication between them. But this proximity is not only lexical. For example, at the end of the 19th century the word “television” was synonym to clairvoyance in spiritist circles. “Clairvoyants were capable of transcending space and time. They could describe ancient edifices or objects with so much precision and detail that it was as if they beheld the place or the object before their very eyes” (3). Yet at the same moment, “television” was but one of dozens of words used in technical fields populating the imagination with a horizon of objects to come. 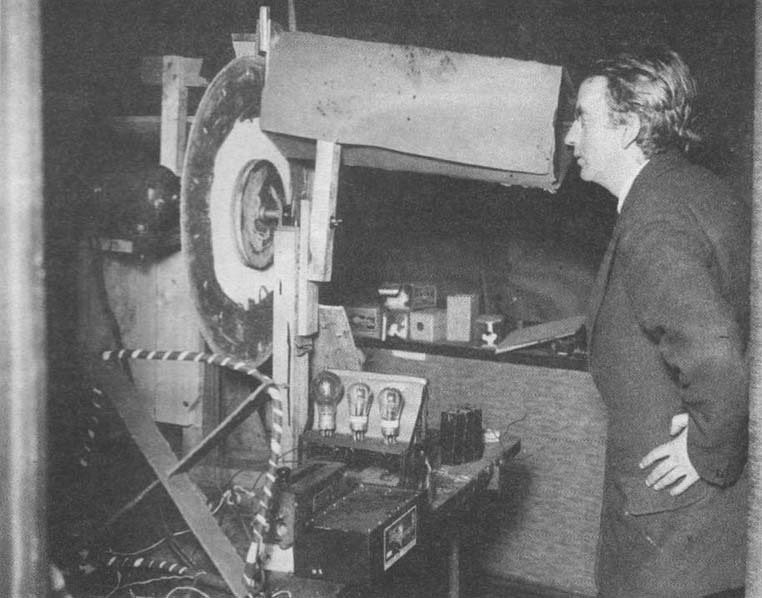 Telephonoscope, Telectroscope, Phonotéléphotographe, Téléchromophotophonotétroscope, Telephote, Electrical telescope, etc. All these names, describing both actualized and fictional objects, bear witness to a discursive and material intermediality. Invention is always plural, an assemblage of descriptions and materials, discourses and actualisations, a remediation of previous specifications and technologies, unforeseen hybridisations, together creating “newness”. For our project, we attempt to relocate the singularity of each of these individuated instances, whether in fictional or popular accounts, as specifications or patent applications for unrealized projects, as artefacts unable to negociate a profitable market position, etc. Each of these agregates describes a particular dispositif, a unique configuration of devices, perceiving subjects and representations. The series of dispositifs for transmission at a distance, or tele-dispositifs, a particularly useful concept developped by François Albéra and Maria Tortajada (4), whether technological or mediumistic, share a certain number of traits, notably a radical telescoping of time and space, characterized by a form of co-presence, a simultaneous and real-time imbrication of a distant information flow within the fabric of the here and now of the perceiving subject. This spatio-temporal superimposition of thoughts, images, or voices from afar was already present at the end of the 19th century via various manifestations of the telegraph, wireless radio, the belinograph, or the telephone. This co-presence participates in a spectral or magical imagination (5) which seems to accompany the rise of each and every dispositif for the transmission of thought at a distance. Singular historical contexts, each with their unique social, economical, cultural and political specificities, give rise to particular inflections of the fundamental elements of the definition of tele-dispositifs (co-presence, immediacy, simultaneousness, etc.) and to the hybridisation of technologies, discourses and bodies. 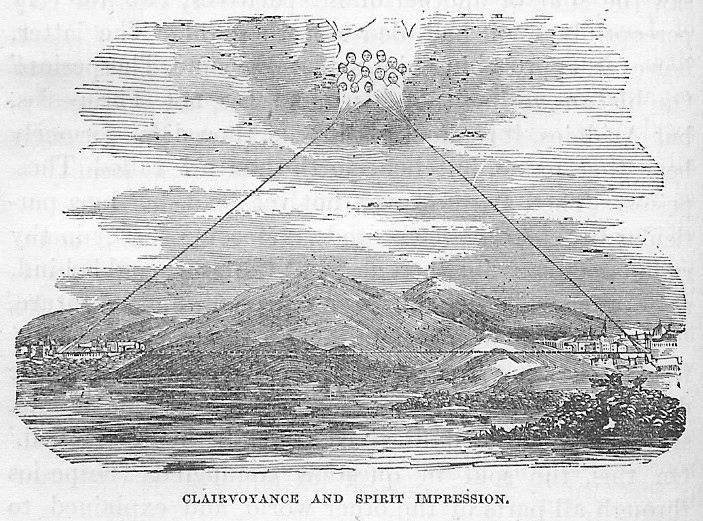 The Celestial telegraph, 1853. Partridge & Brittan in New York . In 1854 a group of Spiritualists petitioned congress for the money to copy Morse’s telegrapgh development with a way to communicate with Spirit by Telegram. More recently, the theorisation of the universal machine by Alan Turing in the 1930s created the conditions of possibility for the actualisation of a long series of digital machines since the 1940s which, in view of their complexity and high-level abstraction, the immateriality and virtuality of the information transported, even their magicial impenetrability, have become the site of a new collective consciousness, a repository of new metaphors. In the discourse networks of the technical milieu which accompanied, and via feedback, were nourished by these new machines (in particular the theory of information and cybernetics), transmission at a distance or communication, became formalized as mathematical models. Claude Shannon and Warren Weaver, using telegraphy as an example, described the most efficient communication system as an equation between maximum information and minimum noise and parasites, a formulation that facilitated the rapid boom in telecommunications after the Second World War. In his manifesto, The Human Use of Human Beings, a more popular account of his book Cybernetics published two years earlier, Nobert Wiener goes even further towards complete dematerialisation via the increased perfection of encoding algorithms. Wiener considered information as a meaningful pattern that he opposed to the tendency of systems to drift towards entropy and total chaos. This led him to speculate that “A pattern is a message, and may be transmitted as a message. How else do we employ our radio than to transmit patterns of sound, and our television set than to transmit patterns of light? 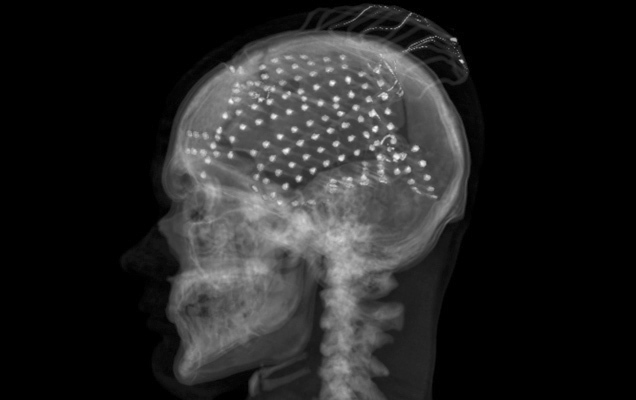 It is amusing as well instructive to consider what would happen if we were to transmit the whole pattern of the human body, of the human brain with its memories and cross connections, so that a hypothetical receiving instrument could re-embody these messages in appropriate matter, capable of continuing the process already in the body and the mind, and of maintaining the integrity needed for this continuation by a process of homeostasis.”(6) And later to declare: “there is no absolute distinction between the types of transmission which we can use for sending a telegram from country to country and the types of transmission which at least are theoretically possible for transmitting a living organism such as a human being.” (7) This speculative text by one of the modern era's greatest thinkers and excentrics, asks, from the point of view of the scientific avant-garde, one of the crucial questions of our study, namely that of hypothetical instruments, and the belief in assemblages of texts, machines and uses that one could consider as veritable objects of science fiction. Neuroscientists reconstructing visual experience and brain activity using a fMRI. UC Berkeley, 2011. Progressively this will for knowledge is accompanied by research into the exploration and deciphering of the workings of the human brain with the long term goal of the transmission of information without any communication media. Seeing into the brain, decoding thought, transmitting and receiving signals instantaneously without sufficient time to formulate ideas... so many hypotheses which have the appearance of science-fiction scenarios and seem impracticable. Transmission of thought remains opaque and uncontrolable. “Thought” remains the only uncharted territory because until now, it had never been scanned nor analyzed, but simply measured in an attempt to understand its inner workings without attaining compelling results. It once seemed impossible to imagine gaining access to the brain of the Other and to be able to understand it using other means than simple daily communication skills. Yet, several recent scientific studies (10) have formulated an opposing hypothesis and tend to prove the possibility of a certain “visualization” of thought, an image in the process of forming within the brain. This formerly impossible research and knowledge, even if still in just the early stages, brings forth such a change in perspective, a questionning of the notion of interiority and the autonomy of the thinking subject, that it is necessary to investigate and reconstruct the historical and philisophical underpinnings for this radical transformation. One of these avenues is the history of the relationships between media and mediums. (1). Média Médiums is an hommage to the first chapter, Mediums and Media of Jeffrey Sconce's book Haunted Media: Electronic Presence from Telegraphy to Television, Duke University Press Books, 2000. (2). Marcello Truzzi quoted in the text by Pierre Apraxine and Sophie Schmit, La Photographie et l’Occulte in Clément Chéroux, Andreas Fischer, Pierre Apraxine, Denis Canguilhem, Sophie Schmit, Le Troisième Œil - La Photographie et l’Occulte, Paris, Gallimard, 2004. (3). Stefen Andriopoulos, Télévision Psychique, p. 62, in Mireille Berton and Anne-Katrin Weber eds., La Télévision du Téléphonoscope à Youtube, Paris, Antipodes 2009. (4). François Albéra and Maria, Tortajada, Prolégomènes à une critique des "télé-dispositifs", in La Télévision du Téléphonoscope à Youtube, op. cit., p. 36-37. (5). Jeffrey Sconce, Haunted Media..., op. cit. (6). Norbert Wiener, The Human Use of Human Beings, Da Capo, 1950, p. 96. (7). Norbert Wiener, op. cit, p.103. (8). Lisa Gitelman et Geoffrey B Pingree, New Media 1740-1915, Cambridge, MIT Press, 2003, p. xiii. (9). Céline Lafontaine in l’Empire Cybernétique, des machines à penser à la pensée machine, Paris, Seuil, 2004, p. 224-225. (10). Georges Smoot III and Jonathan Regier, Kodak Moment à Total Recall, Huffington Post, 6 March 2012.